Yet, some might note that they have heard this tune before. The direct banks and “digi-cash” of the 90s captured the imagination of journalists and investors in a similar fashion, but ultimately had little impact. In fact, the financial services industry has been remarkably impervious to past assaults by innovators, partially due to the importance that scale, trust and regulatory know-how have traditionally played in this space. However, as they say in investing, “past performance is not an indicator of future success” and the same may be true for banks’ and insurers’ record of besting innovators. A new World Economic Forum report takes a look into what the future holds for the industry. It draws on over 100 interviews with industry experts and a series of workshops that put strategy officers from global financial institutions in the same room as high-flying fintech innovators to discuss the issue. 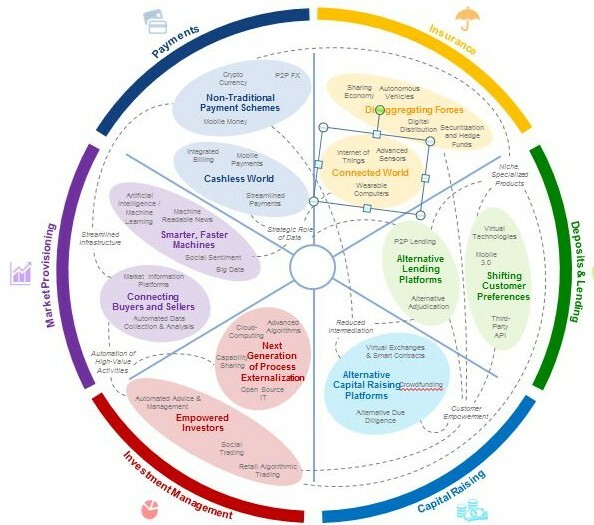 Their findings suggest this round of innovation just might make the big names in financial services rethink their business models in some very fundamental ways. Past innovators often tried to replicate the whole bank, resulting in business models that either appealed only to the most tech-savvy or price-conscious customers. Today’s innovators are aggressively targeting the intersection between areas of high frustration for customers and high profitability for incumbents, allowing them to “skim the cream” by chipping away at incumbents’ most valuable products. It is hard to think of a better example of this than remittance – banks have traditionally charged very high fees for cross-border money transfers and offered a poor customer experience, with transfers often taking up to three days to arrive at their destination. UK-based company Transferwise is challenging this process using an innovative network of bank accounts and a user-friendly web interface to make international transfers faster, easier and much cheaper. Thanks to this business model, the company now oversees over £500 million of transfers a month and has recently expanded into the US. Innovators are also using their technical skills to automate manual processes that are currently very resource intensive for established players. This allows them to offer services to whole new groups of customers that were once reserved for the elite. “Robo-advisers” like Wealthfront, FutureAdvisor and Nutmeg have automated a full suite of wealth management services including asset allocation, investment advice and even complicated tax minimization strategies, all offered to customers via an online portal. While customers must forego the in-person attention of a dedicated adviser, they receive many of the services they would offer at a fraction of the cost and without needing to have the $100,000 in investible assets typically required. As a result, a whole new class of younger, less wealthy individuals are receiving advice and support in their efforts to save, and it remains unclear if they will ever have the desire to switch to a traditional wealth adviser, even as their savings grow to the point where they become eligible for one. Customer data has always been a central decision-making factor for financial institutions – bankers make lending decisions based on your credit score while insurers might look at your driving record or require a health check before issuing a policy. But as people and their devices become more interconnected, new streams of granular, real-time data are emerging, and with them innovators who use that data to support financial decision-making. FriendlyScore, for example, conducts in-depth analyses of people’s social networking patterns to provide an additional layer of data for lenders trying to analyse the credit-worthiness of a borrower. Does your small business get lots of customer likes and respond promptly to complaints? If so, you might be a good risk. Are all of your social connections drinking buddies “checking in” at the same bar? Well that might count against your borrowing prospects. Meanwhile, a new breed of insurance company is identifying ways to generate streams of data that help them make better pricing decisions and encourage their policy-holders to make smart decisions. Oscar, a US-based health insurer provides its clients with a wearable fitness tracker free of charge. This lets Oscar see which policy-holders prefer the couch to the gym and enables them to provide monetary incentives (like premium rebates) to encourage customers to hit the treadmill. As the sophistication of these analytic models and wearable devices improves, we will likely see more and more financial services companies working to nudge their customers towards better behaviour and more prudent risk management. Companies like Uber and Airbnb have shown that marketplace companies, which connect buyers and sellers, are able to grow revenues exponentially while keeping costs more or less flat. This strategy has not gone unnoticed by innovators in financial services. Lending Club and Prosper, the two leading US marketplace lenders, saw their total originations of consumer credit in the US grow from $871 million in 2012 to $2.4 billion in 2013. Lending Club alone issued $3.5 billion in loans in 2014. While this is only a fraction of total US consumer debt, which stood at $3.2 trillion in 2013, the growth of these platforms is impressive. Analysts at Foundation Capital predict that marketplace lenders will issue $1 trillion in consumer credit, globally, by 2025. Even more impressive, they have done so without putting any of their own capital at risk. Instead, they have provided a place where borrowers looking to get a better rate can meet with lenders (both individuals and a range of institutions such as hedge funds) who are eager to invest their money. Crowdfunding platforms have achieved something similar, becoming an important source of funding for many seed-stage businesses. These platforms connect individuals looking to make small investments in start-ups with an array of potential investment targets, and allow the “wisdom of the crowd” to decide which companies will and will not be funded (while taking a slice of the funds from those that are successful). This one might seem strange. After all, disruptors are supposed to devour the old economy, not work with it. But this is an oversimplified view. Smart investors have realized that they can employ bifurcated strategies to compete with incumbents in the arenas of their choosing while piggy-backing on their scale and infrastructure where they are unable to compete. For their part, incumbents are realizing that collaborating with new entrants can help them get a new perspective on their industry, better understand their strategic advantages, and even externalize aspects of their research and development. As a result, we’re seeing a growing number of collaborations between innovators and incumbents. ApplePay, the most lauded financial innovation of the past year, doesn’t attempt to disrupt payment networks like Visa and MasterCard, but instead works with them. Meanwhile, regional banks, like Union Bank in California, are forming strategic partnerships with marketplace lenders, providing referrals for customers they are unable to lend to. This helps them meet their customers’ needs while avoiding the risk that they will leave for another full-service financial institution. Clearly, there is more to this story than simple disruption. How it will play out is still to be seen, although we can safely say that innovators will force incumbents to change, which should ultimately benefit the consumer. But it doesn’t necessarily mean that the brand names we know will be disappearing any time soon – particularly those who learn to play with the new kids on the block. 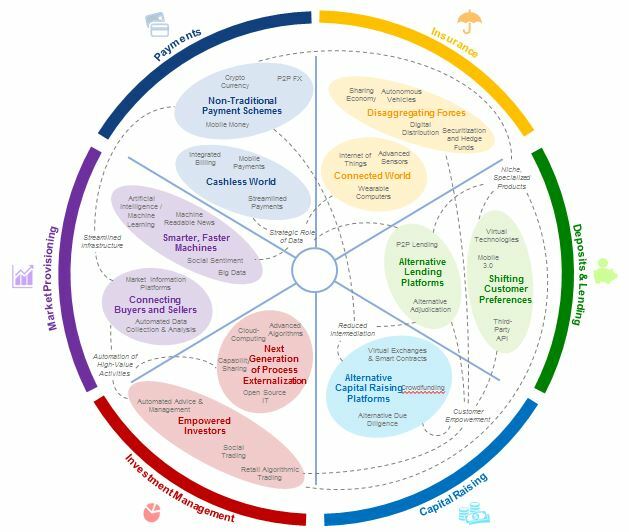 The Future of Financial Services report is available here. Author: Jesse McWaters, Project Manager Center for Global Industries, World Economic Forum. Image: An Apple iphone 6 with Apple Pay is shown in this photo illustration in Encinitas, California June 3, 2015. REUTERS/Mike Blake.